As I’ve mentioned before, I recently realized how amazing cashew cream is, and figured out how to make it at home. If you haven’t tried it yet, it’s really amazing. 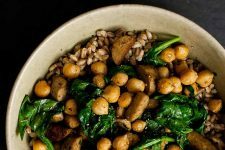 Every time I think of a recipe that traditionally uses coconut cream or heavy cream, the first thing my mind jumps to is, I wonder how that would turn out with cashew cream instead. I’ve been so obsessed with it lately that I think I should really just buy stock in cashews. It might pay off within the next year. A few weeks ago, I made a cake for my birthday. 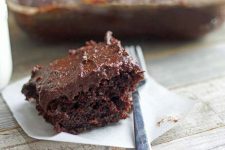 I was brainstorming frosting ideas and I came to the conclusion that a chocolate caramel ganache-type frosting would be incredible, so I Googled it and came across David Lebovitz’s post on how to make perfect caramels. I had some extra cashew cream sitting in the fridge, and decided to use that to make the ganache. Twenty minutes later, I had a delicious ganache frosting on my hands. This unfortunately did not make it to the blog because 1. the cake turned out looking horrible, despite how good it tasted, and 2. I didn’t think to measure anything out. But, that frosting got my brain-wheels turning. 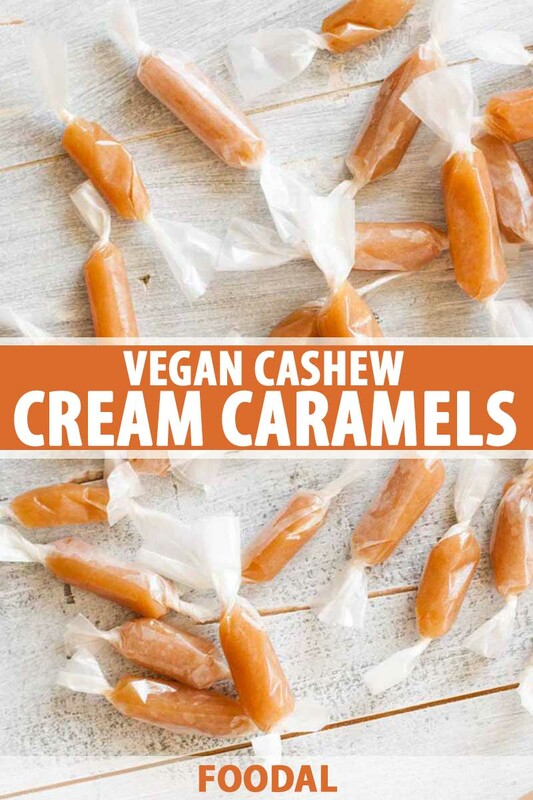 The next thing I knew, I was trying to figure out how to make regular, chewy candy caramels with cashew cream! I wasn’t sure if it would work. I kind of figured that if it were possible, someone would have done it already, and Google would know about it. But my 0.5-second internet search did me no good, so I was off into unknown territory with just some raw cashews and a crazy black dog as my sole companions. And guess what! I am happy to report that not only does it actually work, it turned out beautifully! 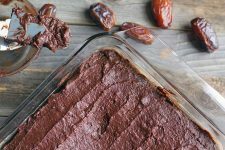 After I poured it out of the pan, I honestly stood there over the remaining bit that was left behind for just a moment, and then spooned it into my mouth as fast as I could. I may have lost a few taste buds to the high heat, but that’s okay because it was so, so tasty! I purposely made these caramels super soft. They will literally melt in your mouth and disappear down your throat and you’ll be going back for another one before you even know what happened. I did this because I have big plans for these babies coming soon (!) and this was the texture that I needed. 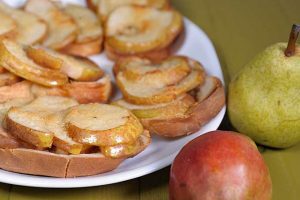 But if you want to have these just for the simple pleasure of eating, feel free to make the adjustments noted at the bottom of the recipe for a firmer texture. Also, a note on the corn syrup. It’s oooo-kayyyy to use it. Really. It’s okay. It’s not high-fructose corn syrup. It’s just like any other sweet syrup, and it has the proper molecular makeup to help keep the sugar granules from re-crystallizing. This is why it’s super popular in baked desserts like pecan pie as well. In other words, you’re not going to die if you eat a tiny bit of corn syrup. I promise. 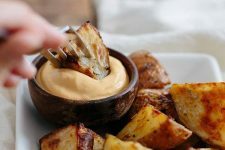 An easy caramel recipe that uses cashew cream instead of dairy! 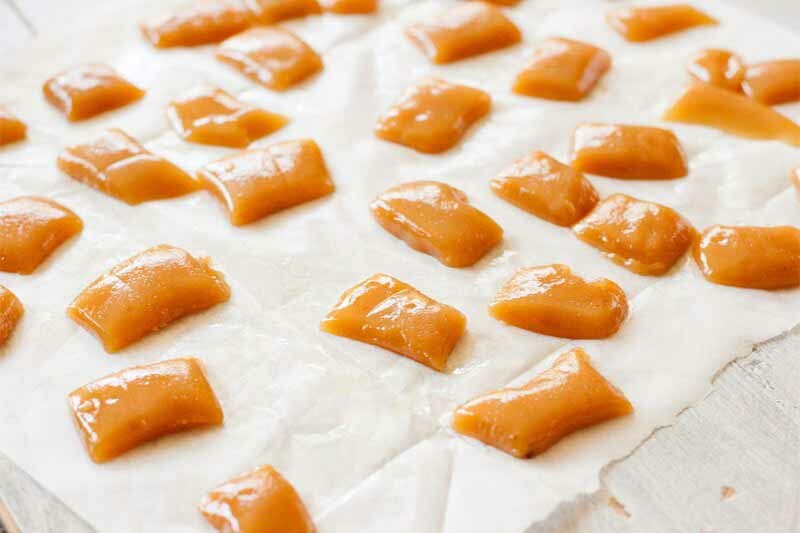 Creamy, dreamy flavor and a melt-in-your-mouth texture make these candies incredibly irresistible. Line an 8×8″ pan with parchment so that it hangs over the edges. Spray with cooking spray and set aside. Measure 2/3 cup water in a 2-cup glass measuring cup and heat in the microwave until boiling. Add the cashews and set aside to soak for at least 1 hour. Place the cashews and their soaking liquid in a blender and blend until very smooth, about 1 minute. Transfer back to your measuring cup; you should have just a bit less than 1 cup of cashew cream. Add cold water if necessary to bring it up to an even cup. Place the cashew cream, margarine, and salt in a small saucepan over very low heat and stir occasionally, until the margarine is melted. 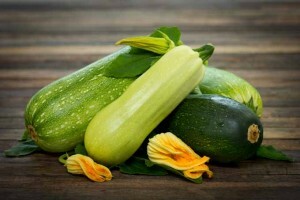 Do not allow it to boil, or even simmer around the edges. This must be done on the stovetop rather than in the microwave. 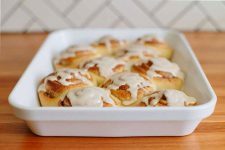 While the cream is warming, place the sugar, corn syrup, and 1/4 cup water in a large 4-quart saucepan A light-colored heavy-bottomed pan works best. Stir until the sugar is evenly moistened. Clip a candy thermometer to the side of the pan so that the heat sensor is immersed in the sugar mixture, but not touching the bottom of the pan. Place over medium heat and allow the sugar mixture to come to a boil without stirring. Let the mixture cook (again, without stirring) until it reaches 300-310°F. 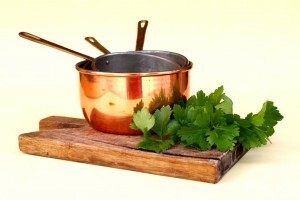 If necessary, tip the pan to fully immerse the thermometer in the mixture to get an accurate reading. 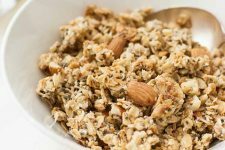 Once the mixture reaches temperature, remove from the heat and slowly pour in the warm cashew mixture while stirring rapidly, until thoroughly combined. It may spatter a bit while you do this, so be careful! Return the pan to medium heat and continue to cook without stirring until the temperature reaches 245°F (your thermometer may initially read higher than this if it is still coming down from when you added the cashew cream). As soon as it comes to temp, quickly remove from the heat. Without scraping the bottom of the pan, stir in the vanilla and then pour into your prepared pan. 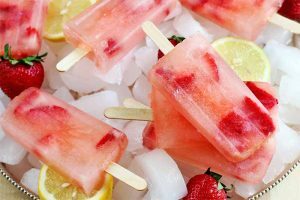 Let cool to room temperature, then refrigerate for a few hours before cutting into smaller pieces. Wrap individually in wax paper. 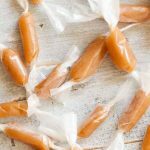 Caramels may be stored at room temperature for 1-2 weeks, or in the refrigerator or freezer for much longer. 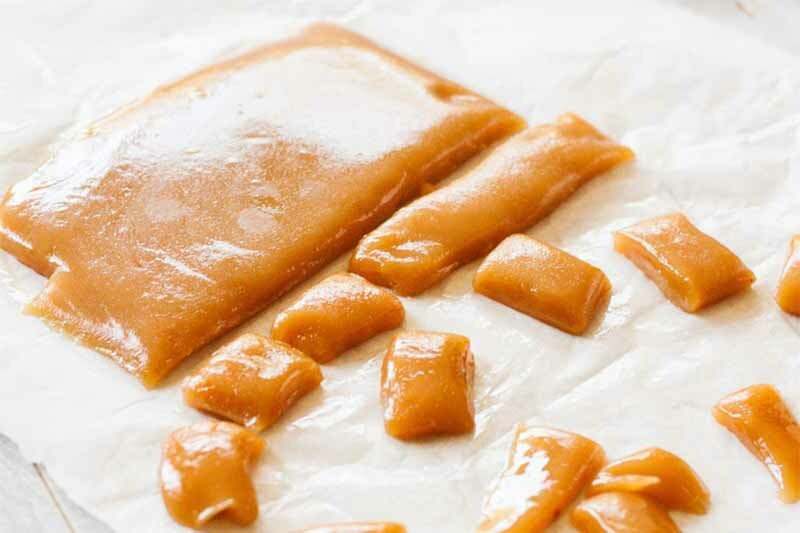 This recipe makes rather soft, melt-in-your-mouth caramels. 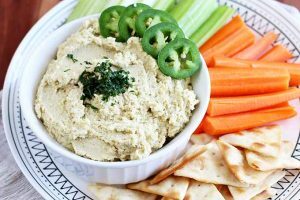 If you’d like a more chewy variety, decrease the margarine to 4 Tbsp and only use 3/4 cup of the cashew cream. 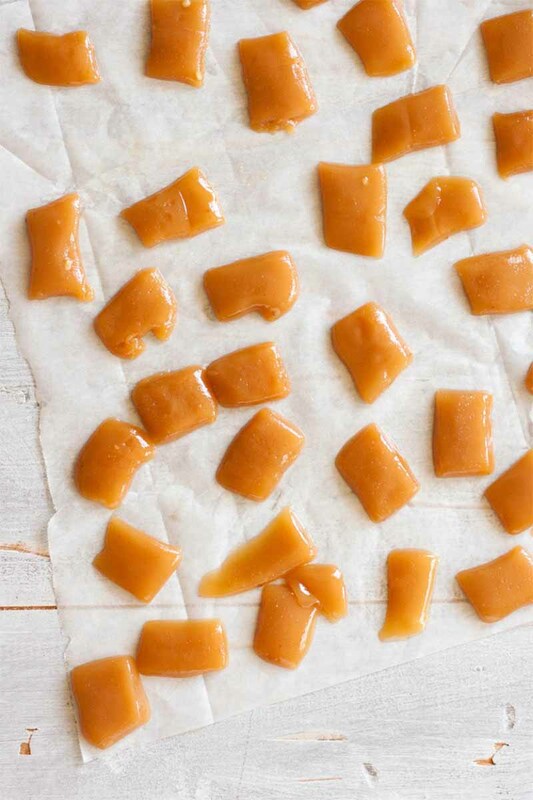 Vegan caramel is such an amazing treat, and I really hope you do try making it at home. 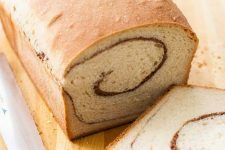 Don’t forget to tell us about your experiences in the comments below, and give the recipe five stars if you loved it! Photos by Raquel Smith, © Ask the Experts, LLC. ALL RIGHTS RESERVED. See our TOS for more details. Originally published on June 20th, 2014. Last updated: November 12, 2018 at 10:41 am. Thanks, Dina! They’re really good! I cannot handle how amazing these look. Definitely going to make them! I hope you do! Let me know how they turn out. Hi! What would be a good way to eliminate the corn syrup? I am allergic but would love to make these.Thanks! Hey Lisa – so sorry for the delay on this. 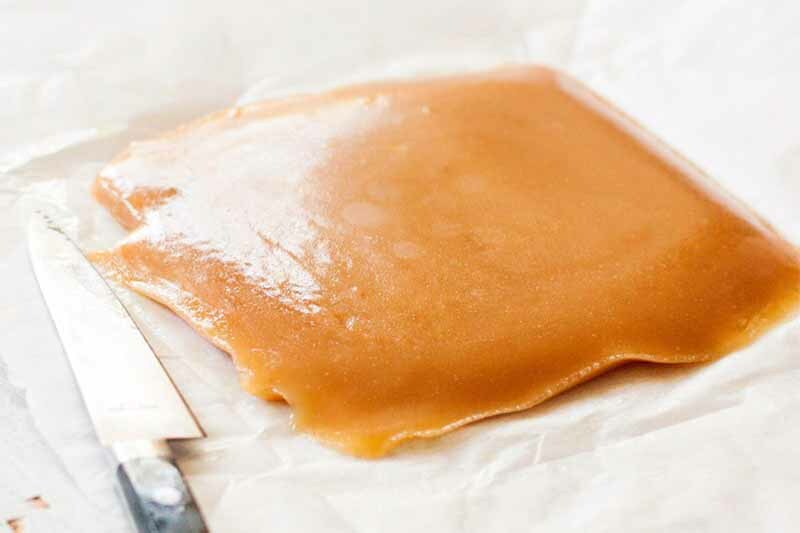 According to chef and author David Lebovitz on his website, “If making a caramel, and a recipe calls for corn syrup, you can substitute a dash of lemon juice or cream of tartar, which performs nearly the same function.” Hope that helps! Hi Raquel. I just found your blog and I already have a list of recipes to try. 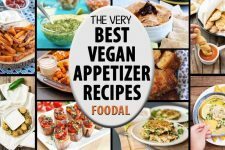 I just recently became a vegan and have been searching all over the Internet for some of my staple recipes to make in a vegan way. 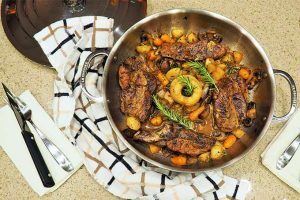 I don’t know why I haven’t found your blog before… But I’m glad I did, as you have some of my favorite recipes and some new ones to try in a very simple, no nonsense way. Thanks. Glad you found me, Virginia! Great to have you here. The cashews: Raw? Salted? Unsalted? Roasted? Help!! 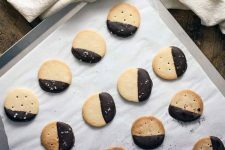 I’m dying to try this recipe and I’m sure the differences in the cashews will have an effect on the flavor. Thanks!! 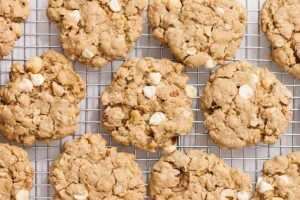 Raw, unsalted cashews should be used to make this recipe (we’ve updated the recipe card to reflect this). 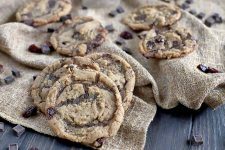 A roasted or salted version will definitely have an effect on the flavor, and possibly the moisture content of the mixture as well. 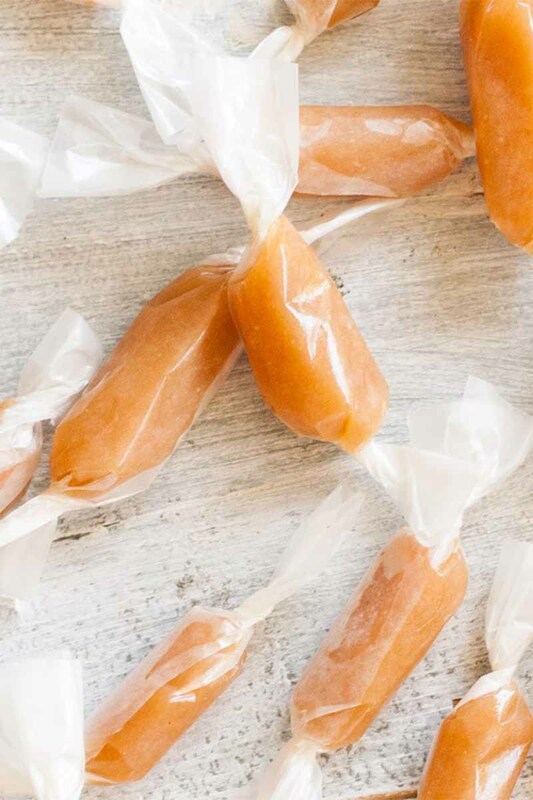 I have been experimenting with different caramels but they end up very sticky on the bottom side only.. Do you know if i could make this recipe with coconut milk and maple syrup to sub cashew cream and corn syrup? Why do you say no scraping the bottom of the pan? I make amazing caramels (if I say so myself), but as my mom was just in hospital for a TIA, she’s not wanting to use much oil/butter nowadays. 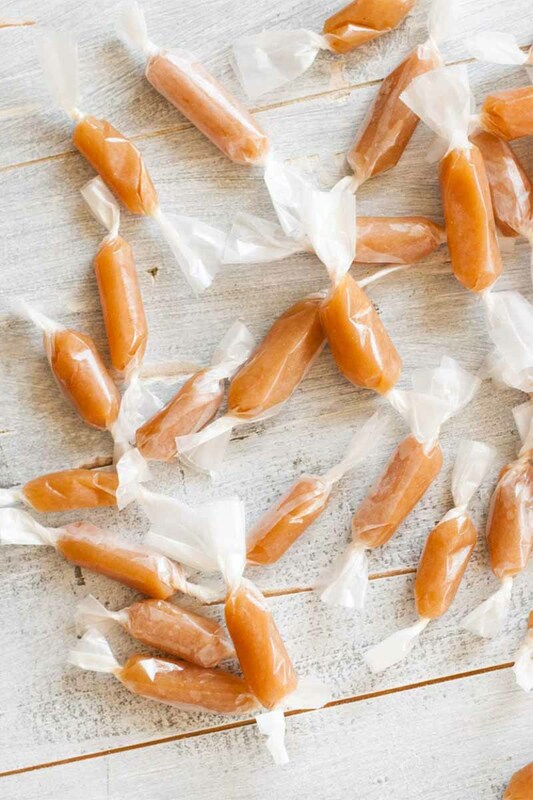 I’m wanting to try a recipe like this as my caramels are her FAVORITE thing EVER, but I want to do it correctly and I was wondering about the scraping (as it comes natural to me?). 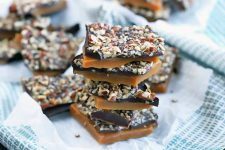 Since crystallization can be caused by stirring when you’re making caramel, scraping the pan isn’t recommended for this recipe. This definitely comes naturally for most cooks, so it does take some getting used to! This is a find! 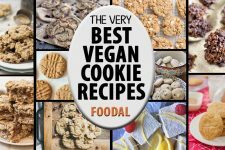 My non-vegan husband likes these more than dairy caramels! Nice work! Awesome! So glad these were a hit, Nicole!